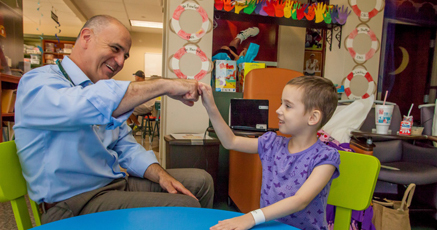 Dell Children’s Medical Center is part of Children’s Hospitals’ Solutions for Patient Safety (SPS), a national learning network dedicated to providing children across the country with the highest quality and safest care possible. The SPS network, a partnership of over 90 children’s hospitals nationwide, is committed to the transparent sharing of information as these organizations work together to help save children from preventable harm. Part of Dell Children’s commitment means stressing the importance of never losing sight of child safety as a top priority. Together with the other hospitals that are part of SPS, we hope to reduce readmissions, hospital-acquired conditions and serious safety events. Because you know your child best, families of the children at Dell Children’s play an integral role in our fundamental goal of zero harm. Please always ask questions, stay informed about your child’s treatments and medications and follow guidelines such as regularly washing your hands. Dell Children’s also offers ongoing programs and services, such as Respiratory Virus Season Screening, to encourage further awareness about patient health and safety. Together, Dell Children’s, SPS and our patients and their families can create a powerful force working together for the health and safety of each and every child in our care.